Avandia helps Type 2 diabetes patients control their blood sugar by making them more sensitive to insulin. Common side effects of the antidiabetic drug include headache and cold-like symptoms. Studies also link the medication to several serious and even potentially fatal side effects including heart attacks. Approved in 1999, Avandia is used along with diet and exercise and sometimes other medicines to treat Type 2 diabetes. Through the years, it has gone from being a top-selling medication to a disgraced diabetes drug because of its risks. The most common Avandia side effects reported during clinical trials were cold-like symptoms and headache, according to the prescribing information. More than 5 percent of patients in the trials reported upper respiratory tract infection, injury and headache. And studies link the drug to liver failure and a risk of increased pregnancy. But the impetus for the medication’s abrupt fall was a 2007 article by cardiologist Steven Nissen and Kathy Wolski of the Cleveland Clinic that exposed the drug’s association with heart risks. Avandia lawsuits that followed accused the drug’s manufacturer, GlaxoSmithKline, of hiding the risks of heart attack and cardiac death from the public. The U.S. Food and Drug Administration and GlaxoSmithKline have long recognized that rosiglitazone, the active ingredient in Avandia, may be associated with certain heart problems. 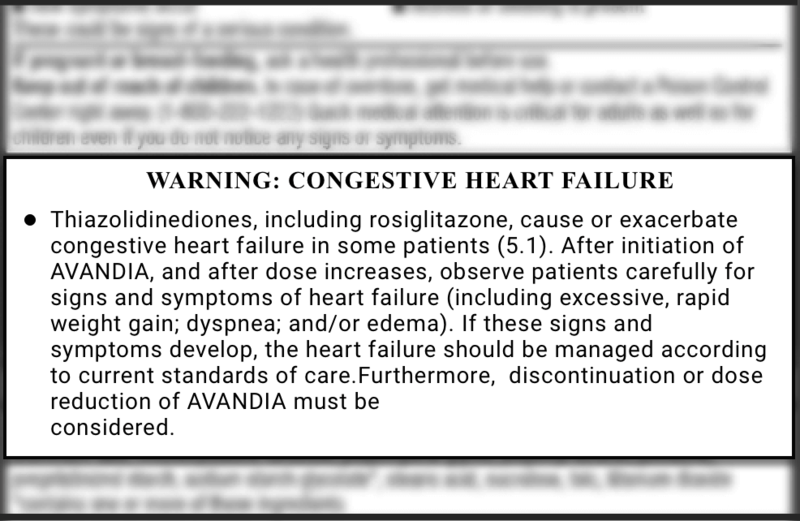 Avandia can cause or exacerbate congestive heart failure in some patients. The prescribing information for all rosiglitazone-containing products has addressed the risk since 2001, but the FDA has significantly strengthened the warnings over the years. In 2007, the FDA required GlaxoSmithKline to add a black box warning to the drug’s label to notify consumers that the drug can cause or exacerbate congestive heart failure in some patients. The warning also advises against use of the drug in patients with symptomatic heart failure and in patients with established New York Heart Association (NYHA) Class III or IV heart failure. The FDA released a safety alert about the heart risks in 2007 and sought advice from 24 experts in cardiovascular disease, epidemiology, biostatistics and endocrinology. On July 30, 2007, the experts convened at a joint meeting of the FDA Endocrinologic and Metabolic Drugs Advisory Committee and the Drug Safety and Risk Management Advisory Committee. “After lengthy discussions, we concluded that the use of rosiglitazone for the treatment of Type 2 diabetes was associated with a greater risk of myocardial ischemic events than placebo, metformin, or sulfonylureas,” Dr. Clifford J. Rosen, the joint committee chair, wrote in The New England Journal of Medicine. The experts based their conclusion on three studies, including one that used GlaxoSmithKline’s own data. The findings revealed increases in heart risks as high as 43 percent in people taking the drug. The FDA as well as outside experts have continued to study the side effects of Avandia on heart health. In 2010, the FDA announced it was significantly restricting the use of the drug to patients with Type 2 diabetes who could not control their diabetes on other medications. “These new restrictions are in response to data that suggest an elevated risk of cardiovascular events, such as heart attack and stroke, in patients treated with Avandia,” the agency said. For three years, the drug was considered all but banned in the U.S. and became known as a last resort for people with diabetes who were so sick that they were willing to risk having a heart attack. Consumers concerned about the heart risks associated with the drug questioned why it had not been recalled in the United States. The European Medicines Agency had removed the drug from the market in Europe. The FDA has since lifted the restrictions on the drug’s use, but the heart failure and heart problem warnings, including the black box warning, remain in the prescribing information. The black box warning says health care professionals should carefully monitor patients for signs of heart failure after they start the drug and after each dose increase. Signs of heart failure include: excessive, rapid weight gain; difficult or labored breathing; and swelling. GlaxoSmithKline has repeatedly updated Avandia’s label to include new information about bone fracture risk. In 2007 — eight years after the drug hit the market — a new drug label featured information about increased incidence of bone fractures in women. 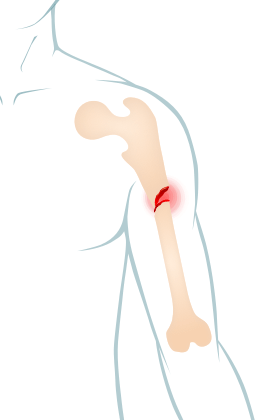 By October 2008, the label cautioned that the bone fracture risk may also apply to men. The labeling changes were the result of long-term trials that found an increased frequency of bone fracture in more than 200 patients who took the drug. Drugs like rosiglitazone are said to cause slower bone formation and faster bone loss. Researchers believe the drugs trigger the body to reabsorb bone, which can make bones more likely to break. Long-term trials RECORD (Rosiglitazone Evaluated for Cardiac Outcomes and Regulation of Glycemia in Diabetes) and ADOPT (active-controlled trials in patients with diabetes) were among the studies with findings that prompted the bone fracture warnings. An increased incidence of bone fractures, particularly in women, “was noted after the first year of treatment and persisted during the course of the trial,” according to the drug’s label. Long-term trials showed an increased rate of bone fracture in more than 200 patients, particularly women, who took Avandia. Most fractures in the women who received the drug happened in areas not usually associated with postmenopausal osteoporosis. Bone fractures were in the upper arm, hand and foot; postmenopausal osteoporosis is associated with fractures in the hip or spine. In 2008, Swiss researchers analyzed records of British diabetic patients with fractures and found patients on Avandia or Actos had double the odds of fractures in sites other than the spine. Patients who took the drugs for about 12 to 18 months had an even higher chance of bone fracture. The highest risk was for those with two or more years of treatment with the drugs. The research published in the journal Archives of Internal Medicine compared the records of 1,020 diabetic patients with fractures diagnosed by British doctors between 1994 and 2005 against a control group of people with diabetes who did not have fractures. “This analysis provides further evidence of a possible association between long-term use of [the drugs] and fractures, particularly of the hip and wrist, in patients with diabetes mellitus,” the authors wrote. A study published in 2010 in Diabetes Obesity and Metabolism found the use of rosiglitazone is associated with an increased risk of fractures in both women and men. A 2010 study in Diabetes Obesity and Metabolism provided evidence that men might be subjected to similar bone risks as those previously described in women. The study found a significant decrease in bone mineral density in people taking the drug. It also demonstrated that the risk of bone fracture is increased even in younger women. “Our findings add support to the growing literature that TZD treatment is associated with an increased risk of fractures in both men and women, that effects of rosiglitazone and pioglitazone are similar and that fracture risk is increased even in younger women,” the study’s authors wrote. A different study published in Acta Diabetologica in 2015 found results consistent with the findings of previous trials that showed the drug is associated with an increased risk of bone fractures in women and probably men, too. Before Avandia gained FDA approval in 1999, the biggest concern surrounding the drug had been whether it would cause liver toxicity. Researchers had linked a similar drug, Rezulin, to scores of confirmed cases of liver failure, and it was ultimately pulled from the market. Records show SmithKline Beecham representatives repeatedly assured the FDA’s Endocrinologic and Metabolic Drugs Advisory Committee that Avandia would not damage the liver. The committee ultimately endorsed the drug and unanimously recommended FDA approval. However, within a year of entering the market, the drug was linked to two cases of liver failure. In one case, the patient had also taken Rezulin. One of the patients died, and the other recovered without needing a liver transplant. Evidence suggests Avandia can cause severe liver damage. Since then, studies have implicated the drug in liver failure. One case series published in 2009 in Pharmacoepidemiology & Drug Safety showed evidence that rosiglitazone and pioglitazone (Actos) can cause liver problems. It found 21 cases of liver failure associated with the drugs among all cases of liver failure reported to the FDA between 1997 and 2006. “This is the largest case series of liver failure associated with rosiglitazone or pioglitazone reported to date, strengthening the evidence that these drugs can cause severe hepatotoxicity,” the authors wrote. 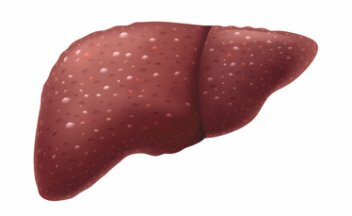 Today, the drug’s label warns doctors to measure their patients’ liver enzymes before starting therapy and periodically throughout treatment. Patients with abnormally high liver enzyme levels should not start taking the drug. “Do not initiate Avandia if the patient exhibits clinical evidence of active liver disease or increased serum transaminase levels,” the drug’s label states. Doctors should be cautious about continuing treatment in patients with mild liver enzyme elevations. These patients require “close clinical follow-up, including liver enzyme monitoring, to determine if the liver enzyme elevations resolve or worse,” according to the drug’s label. 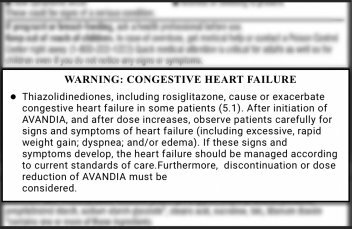 Although heart failure, bone fractures and liver toxicity are the more well-known side effects of Avandia, the drug is also linked to other life-altering effects, including swelling, weight gain, vision problems, blood and blood sugar effects, and an increased risk of pregnancy. During controlled clinical trials, patients with Type 2 diabetes who took the drug reported mild to moderate edema, or swelling, that may have been dose related. Edema occurs when fluid becomes trapped in the body’s tissues. The drug can cause fluid retention, which can worsen or lead to congestive heart failure. “In a clinical trial in healthy volunteers who received 8 mg of Avandia daily for 8 weeks, there was a statistically significant increase in median plasma volume compared with placebo,” the drug’s label states. Increased plasma volume is necessary for edema to develop, according to a study published in American Journal of Physiology. Edema can become increasingly painful and uncomfortable. Sometimes, the swelling causes stiffness, decreases blood circulation and makes it difficult to walk. The side effect may be dose related, and the drug should be used with caution in people with edema. People with ongoing edema who take both insulin and Avandia have a greater chance of experiencing adverse events associated with edema. People who took Avandia by itself and in combination with other diabetes drugs during clinical trials experienced unusually rapid weight gain. It’s unclear exactly how the drug caused users to gain weight, though it “probably involves a combination of fluid retention and fat accumulation,” according to the drug’s label. “In postmarketing experience, there have been reports of unusually rapid increases in weight and increases in excess of that generally observed in clinical trial,” the drug’s label states. One trial compared rosiglitazone to metformin. On average, patients who took rosiglitazone gained about 6 pounds while those who took metformin gained less than half a pound. A third of patients treated with rosiglitazone gained more than 11 pounds compared with just 7 percent of patients treated with metformin. Patients who experience increases in their weight should be assessed for fluid accumulation as well as edema and congestive heart failure. Some diabetic patients who were taking Avandia reported experiencing macular edema. The American Academy of Ophthalmology defines macular edema as swelling or thickening of the part of the eye responsible for detailed, central vision, known as the macula. Macular edema is the result of fluids leaking from blood vessels in the retina. The macula allows a person to do things like read, sew or recognize a face. When the macula is swollen, it does not function properly. As a result, patients who developed macular edema reported blurred vision and decreased visual activity. Vision improved for some patients after they stopped taking the drug. Adults treated with Avandia showed decreases in average hemoglobin, the protein found in red blood cells that carries oxygen throughout the body, and hematocrit, the number of red blood cells in the blood. The decreases varied based on the amount of drug patients took. These blood effects could be related to the increase in plasma volume that results from taking the drug. Patients should undergo periodic fasting blood glucose and HbA1c tests to monitor their response to the drug. People who mix antidiabetic medications may be at risk for hypoglycemia. A doctor may instruct you to reduce the dose of the other diabetes drug. Some premenopausal anovulatory (not ovulating) women may experience ovulation while taking this drug. This could put users at an increased risk for pregnancy while taking the drug. The label advises doctors to recommend adequate contraception in premenopausal women. The FDA cautions women to avoid using the drug while pregnant. “This possible effect has not been specifically investigated in clinical trials; therefore, the frequency of this occurrence is not known,” the drug’s label states. Preclinical studies showed hormonal imbalance. Women should review with their doctors the benefits of continuing treatment if unexpected menstrual dysfunction occurs.